The Klamath Basin, an area comprising more than 5,600 square miles within south-central Oregon and northern California, is drained by the Klamath River, which pierces both the Cascades and the Coastal mountain range before emptying into the Pacific Ocean in California. The water features within the basin are considerable and varied. The shallow, turbid water of Upper Klamath Lake contrasts dramatically with the clear, turquoise water of Crater Lake, which located in the northern portion of the basin. Without question, water is the single most valuable resource of the Klamath Basin and because of its' importance, water is at the center of Klamath Basin resource issues. Agriculture, which is in part possible because of the Klamath Project constructed in the early 1900's by the Bureau of Reclamation, relies on water. Water is also integral to the natural resources of the basin. 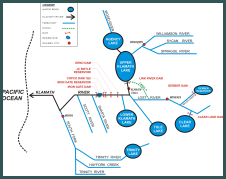 Because the Klamath Basin is often "water short" there is considerable potential for and a history of conflict related to water within the Klamath Basin. Resolving the Klamath prepared by the Oregon Water Resources Department, presents an excellent summary of the resource, social, and economic issues associated with water in the Klamath Basin. Water and those resources dependent upon water within the Klamath Basin are the foci of this Decision Support System (DSS). By sharing and integrating water and resource data through this DSS, the hope is that the potential for future conflicts involving water can be understood and resolved and the local community can make timely decisions affecting their daily lives.